XANTHOCROID is a Black Metal band from the United States of America, releasing their second album called, “Of Erthe and Axen, Act I,” which is followed by Act II and compiles the ultimate creative efforts of this talented and innovative band, following their groundbreaking debut released in 2012 under the name, Blessed He with Boils. The first song, “Open the Gates, oh Forest oh Keeper” is compiled by a symphonic intro worthy of any of the great minds of the so called classical composers, one of the best ways to start an album to blow the audience’s mind after the first approach to a band tagged as cinematic black metal. The album then opens into a harmonious and melancholy ridden track by the name of “To Lost and Ancient Gardens”, one of the most sublime blend of musical elements that I have had the pleasure to come across, tracks like “In Deep and Wooded Forests of my Youth” become a complete experience both for the sound effects and the voice of Ali Meador along with the talent and obvious multi-instrumental ability of the musicians making this and unforgettable and intimate involvement as a new experience in music. 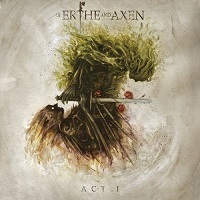 The evolution of this album is a true work of mastery both on the side of the songwriting and the production, as the sonic force behind both the melodic and heavy elements throughout the almost perfect first act of “Of Erthe and Axen,” leaves the listener wanting the second act as a necessary continuation of this sonic journey. After having listened to hundreds of different albums, the feeling you get when coming across a new work of musical creativity that fulfills the measure of one’s taste allowing for one to “like” something new, even after confronting people, trends and experiences that for some reason find it better to stay in their musical comfort zone than to venture into the light of new creations has no comparison and the contrasts and effects created by XANTHOCROID accomplish that precisely. The atmospheres created by this record move the listener on its very core, and the innovation portrayed with the combination of the synth and the sound effects assembled together with both the female and the male voices in crescendo to introduce the growls and the intensified structures of the further songs, making this first act of “Of Erthe and Axen” a valuable part of the Metal Temple collection, growing with anticipation for the second act of this outstanding work of art.